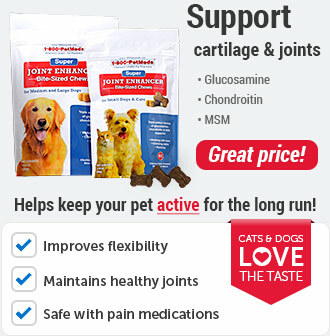 Chlorpheniramine is an antihistamine in tablet form meant to be used for the temporary relief of allergy symptoms in pets. 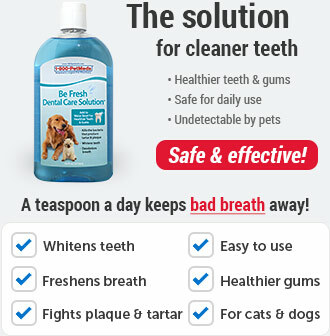 Chlorpheniramine Compounded is also available as a chewable tab, liquid, or transdermal. Chlorpheniramine works to remedy contact, inhaled, or drug-induced allergies in dogs and cats by blocking the effects of histamine in the body. While in 4mg strength it's over-the-counter, there are possible negative interactions with other medications. Consult with your veterinarian. Side effects may include drowsiness, vomiting, diarrhea, lack of appetite, dry mouth, and urinary retention. Do not store in the bathroom, as it's sensitive to moisture. What is the most important thing I should know about Chlorpheniramine? Chlorpheniramine is an antihistamine used in the treatment of contact, inhaled or drug-induced allergies in dogs and cats. 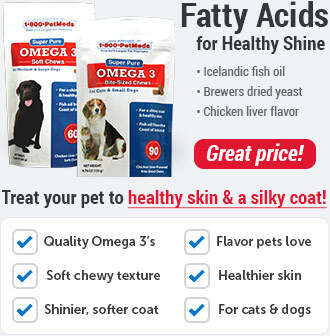 It is also used to treat miliary dermatitis in cats. Chlorpheniramine is not FDA approved for use in veterinary medicine; however, it is a commonly accepted practice to use this medication in dogs and cats. 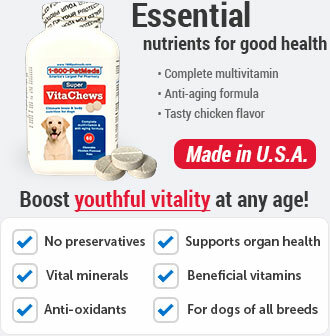 The usual dose for dogs is 2-8mg every 8-12 hours. For cats the usual dose is 1-2mg every 8-12 hours. Do not open or crush the long-acting capsules. What are the potential side effects of Chlorpheniramine? Side effects may include drowsiness, vomiting, diarrhea, and lack of appetite. Dry mouth and urinary retention can also occur. What should I avoid while giving Chlorpheniramine to my pet? This medication should not be used in animals allergic to chlorpheniramine or similar antihistamines. Do not use in patients with glaucoma, prostate disease or urinary obstruction, stomach or intestinal obstruction, high blood pressure or hyperthyroidism. What happens if I overdose my pet on Chlorpheniramine? 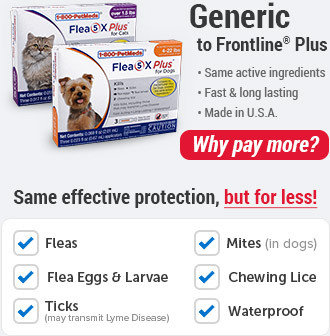 Contact your veterinarian or veterinary emergency room. Symptoms of overdose may include excitement or seizure, drowsiness, coma, respiratory depression and death. Use caution when given with phenothiazines such as acepromazine and other central nervous system (CNS) depressant medications. Chlorpheniramine should not be used with monoamine oxidase inhibitors (MAOIs) such as selegiline and Preventic tick collar. Use caution when given with metoclopramide. Do not use chlorpheniramine when it is in combination with other medications such as acetaminophen or caffeine such as found in various cold and sinus products. Do not use in pregnant or lactating animals. 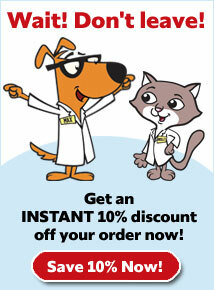 Always tell your veterinarian and pharmacist what other medications your pet is taking. 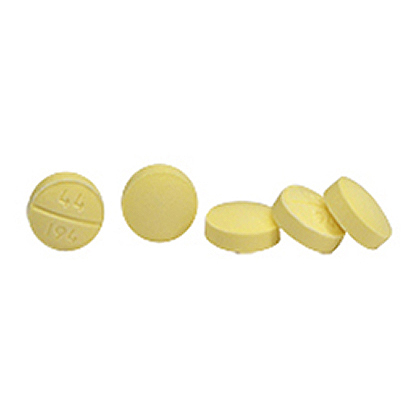 Chlorpheniramine 4mg tablets are an over-the-counter (OTC) product. 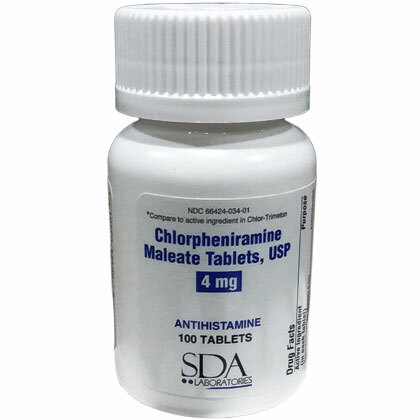 Chlorpheniramine 4mg tablets are an antihistamine used to treat allergies. Chlorpheniramine can interact with other medications. Check with your pharmacist or veterinarian before giving this medication to pets taking other medications. Other Ingredients: D&C Yellow #10, lactose, magnesium stearate, microcrystalline cellulose, pregelatinized starch.